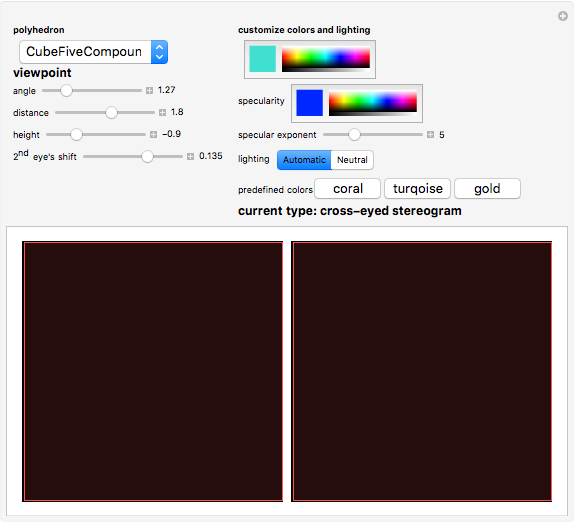 In this Demonstration you can view Mathematica's built-in set of polyhedra (consisting of more than 190 examples) in 3D using the "parallel view" or "cross-eyed" technique. Drag the "angle" slider to see a continuously rotating 3D object. Try to adjust the shift so that you can easily "lock on" the stereoscopic image, then increase the amount of shift for a better 3D experience. Positive shift results in a "cross-eyed" stereogram, while negative shift results in a "parallel view" stereogram. Also, you are free to customize colors and lighting. Gergely Gyebrószki "Stereoscopic View of Polyhedra"